Scaffold Hoists are fixed to a swinging arm to allow winching of materials from ground level on to scaffolding. 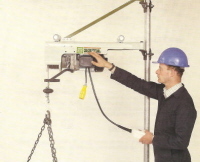 These hoists require a single phase 110V power supply and are capable of lifting 200kg. Please follow this link for our scaffold hoist specification sheets.